That Telecom costs contributes 4% to 6% of total operational expenditures? How to take control over your phone bills with no changes to your infrastructure? Savings on GSM Roaming Charges! 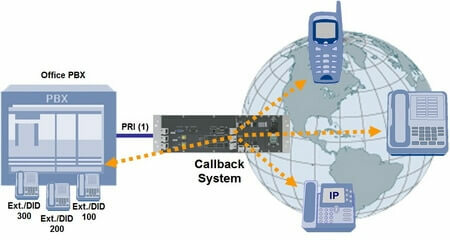 Hypermedia provides a wide range of Call Cost-Saving solutions. ideal for cutting costs on daily communication expenses and overall corporate telephony expenditure, while leveraging existing SMB & Corporate business telephony infrastructure. Hypermedia GSM Gateways give you the opportunity to avoid multiple interconnection fees charged by both Fixed line / Landline and Cellular operators, and benefit from a low-cost solution for routing the switchboard fixed-to-mobile and mobile-to-fixed calls directly via the cellular networks. Get an instant price quote: SAVE 70% off the office phone bill per MONTH!. Businesses can cut back international and national (transnational) GSM roaming charges and reduce company phone costs by integrating Hypermedia's turnkey Callback solution with the existing phone system; as is. The callback solution re-directs expensive overseas calls made by employees outside the home country to lower-cost local GSM calls, and enables to avoid GSM roaming charges charged by cellular operators for calls made by visitors outside the network (a.k.a. GSM roamers). Within an enterprise, eliminating these additional charges significantly reduces the company phone bill by up to 50%! Local and national call charges occur when calls are made across different networks and operators, country wide. These charges consist of tariffs charged by all networks and operators involved in the call termination process, and significantly increase telephony expenses within an enterprise. By installing a DISA / CallThrough solution from Hypermedia, companies with Telecommuting or Teleworking employees can eliminate local and national call charges through using 'dial-in' functionality, i.e. enabling employees to dial long-distance calls using company lines, or enabling several branches of the same company to use a single PBX phone system. Get further DISA / CallThrough Application information here. National multi-site companies, with separate branch offices interstate, can achieve major call cost-savings by using VoIP connectivity to integrate voice networks and eliminate redundant lines between offices and capitalize their carriers’ low-cost IP network services. See available Hypermedia VoIP Gateways in the top menu. Aceitera General Deheza (Argentina) is a company that specializes in the production of vegetable protein meals, pellets, vegetable oils, refined glycerin and biodiesel production. They also export grains such as wheat, corn and sorghum, meeting internationally recognized quality standards. Aceitera General Deheza required a multipurpose in-house solution for sending and receiving SMS and also reducing expenses on mobile calls by converting fixed to mobile calls into mobile to mobile calls. Aceitera General Deheza required the ability to send bulk SMS (about 200 SMS) in a very short time, 15 minutes every day in order to inform their clients on the cost of corn on a daily basis. In addition, they needed to replace a small GSM modem which was used to receive incoming SMS containing weather information and other data and automatically upload it to a Web page.